We'll call them Input and H3K4 for short. 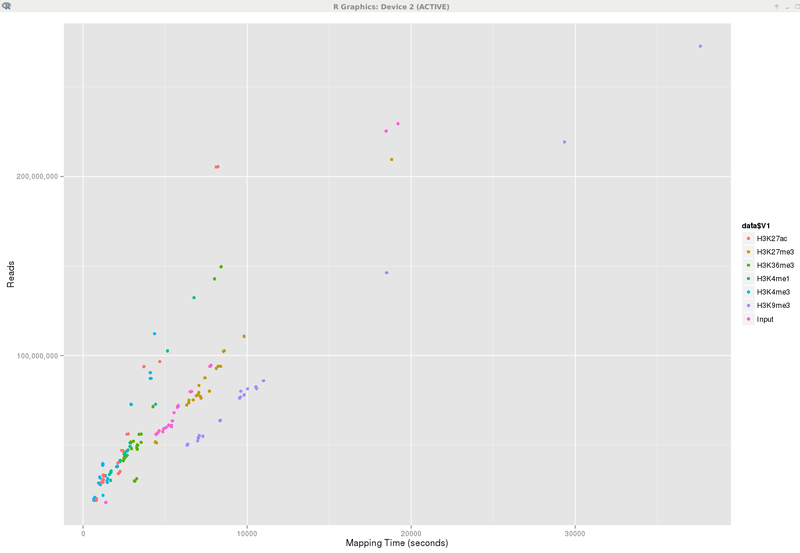 I have the FASTQs (unmapped reads), the uBAMs (unmapped reads in BAM with adapters marked), and the BAMs (mapped reads). Again both good, and seemingly well-mapped. 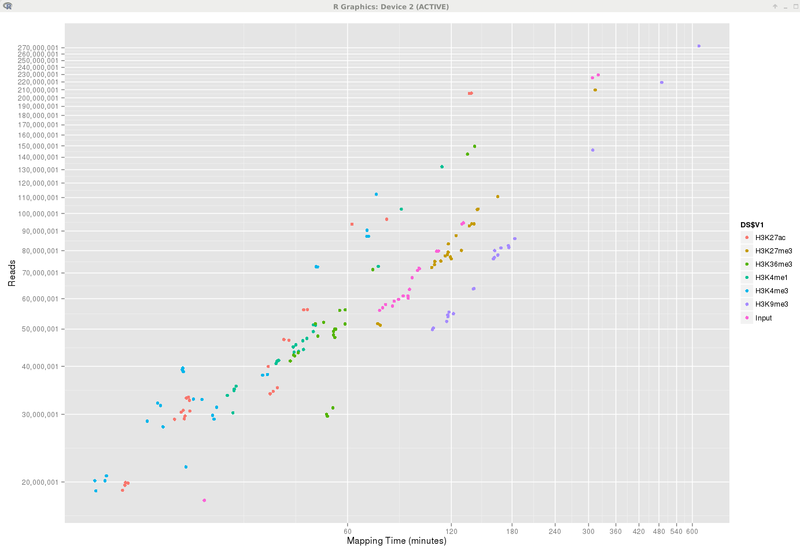 But here's the weird thing: the mapping for Input took 1hr 15min 54s, while the H3K4 sample took just 15min 44s. 1/5th of the time. In fact so quick im concerned it didn't even work, despite what flagstat is telling me. Is this common? Should I be worried? All mapping is happening at the same time, on the same server, which is no where near half-load for CPU or RAM. Are you using the cluster or have you copied these to a local disk? I'm happy to dole out official blessings in return for an espresso :P Anyway, feel free to pop down to the office, we don't bite and you needn't be stranded. My guess is also that this has to due with the peculiarities of H3K4. If you're really nervous, just put the samples through bowtie2 and see if you get similar results. multiBamSummary followed by plotCorrelation in deepTools should give telling results. Repetitive sequences take much longer to map (assuming that you're not masking the repeats). The input includes the repetitive portion of the genome, while (I'm guessing) the H3K4 sample contains considerably less. 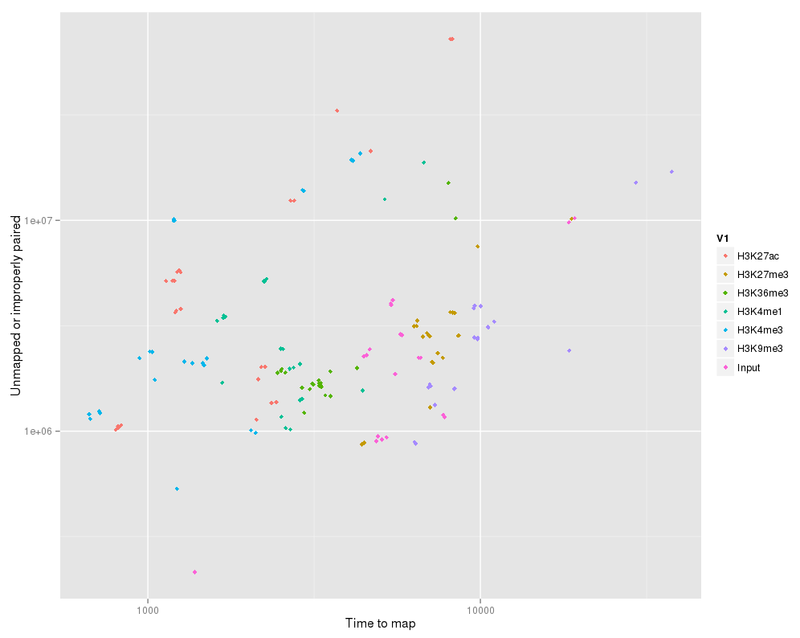 As Devon and Harold have suggested, it seems to be the assay itself that determines how long mapping will take. Those are some nicely convincing graphs! If I recall, some histone marks will predominately pull down low-complexity or repetitive elements (I don't recall precisely which ones, but H3K9me3 rings a bell). This could explain running time differences if the reference being used is not masked. Interesting thought Chris. Personally I thought it might correlate with unmapped reads, so I went ahead to see if there was any correlation (as in, the more unmapped reads you have the more BWA spends an inordinate amount of time trying to map things which wont go anywhere). The result however seems to me like there is not much of a correlation at all. It seems that, as you say, mapping low-complexity reads is more time consuming that mapping high complexity reads, even if the result is they both map. So I guess the conclusion of this whole thread to me is that some assays take longer than others - because their reads take longer to map. Perhaps this would have been obvious to someone who knows the details of the BWA algorithum, but I find it interesting. I would have thought that if reads were looked up from a sort of lookup table [DNA : position on genome], there would be no reason why two uniquely mappable reads would differ in the time to find a position. I know Burrows Wheeler doesn't use a lookup table, but yeah, i think its cool. Perhaps BWA isnt very smart in how it chooses the initial subfragment of a read to map (like maybe it takes the first 20bp, then keeps adding 1 until it finds a match?). Perhaps it would be better to find the 20bp of highest complexity in the read first, then start mapping. That could possibly make BWA 10-100x faster at mapping low-complexity DNA.